KILBOLANE, a parish, in the barony of ORRERY and KILMORE, county of CORK, and province of MUNSTER, 5? 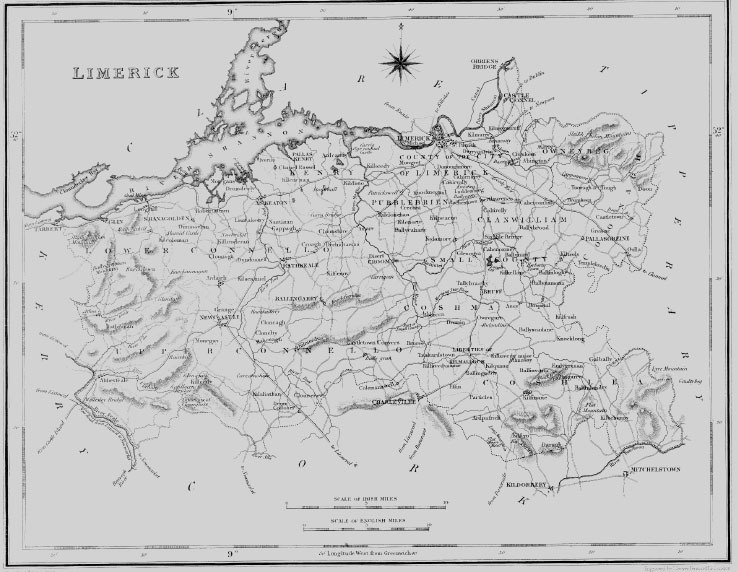 miles (S. W. by W.) from Charleville, on the road to Rathkeale; containing 4014 inhabitants. It comprises 10,207? statute acres, as applotted for the county cess, and valued at #7505 per annum. The land is of good quality and is mostly in pasture; the portion in tillage yields excellent crops of grain and potatoes. There are about 26 acres of woodland, and 100 acres of bog, forming part of the " Red bog," which extends into the adjoining parishes. The seats are Gibbings Grove, the residence of R. Gibbings, Esq. ; Kilbolane House, of Capt. B. E. Barry; Curryglass House, of P. Gould, Esq. ; Proughis House, of J. Bruce, Esq. ; and Hardingville, of C. Harding, Esq. The villages of Millford and Coltycormick are in this parish. It is an impropriate cure, in the diocese of Cloyne, united by act of council to the rectory of Knocktemple, and in the patronage of the Bishop; the rectory is impropriate in the Earl of Cork, and the tithes, amounting to #550, are entirely payable to his lessee, who allows #6. 3. 1. for discharging the clerical duties. A neat church, with a square tower, was erected in 1832, chiefly at the expense of the Rev. J. Bruce, the incumbent, and is now being completed by the Ecclesiastical Commissioners. In the R. C. divisions this parish forms part of the union or district of Millford, or Freemount: the chapel at Millford is a commodious modern building; there is another chapel at Kilbolane. A public school has been lately established at Millford, and another school is partly supported by an allowance of #6 per ann. from Mr. Gibbings; in these, and in the private schools of the parish, about 160 children are educated. The castle of Kilbolane, which was destroyed by Cromwell, was of a square form, with a circular tower at each angle: the ruins are very insignificant. On removing the remains of the ancient church, the tomb of the Synan family, bearing the date 1446, was transferred to the new edifice.